What is the Best Recumbent Exercise Bike for Short People? Unfortunately for short people, finding the right exercise equipment isn’t easy. 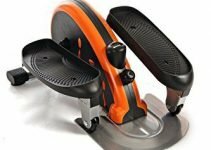 When it comes to a recumbent bike to workout on at home, a very real problem is not being able to adjust the seat forwards enough so that your feet reach the pedals easily enough to workout comfortably. When looking for the best recumbent exercise bike for short people, you should definitely consider our list of the best, as all of them have been reported by quite a few short users to work very well for their needs. The recumbent design on these bikes makes seat adjustment work backwards and forwards on a rail instead of up and down like on a stationary exercise bike. That’s because the pedals are set more to the front of the seat rather than below the seat. So only a bike that includes enough notches close to the pedals in the front will be suitable for short people or those with a short inseam. Tall users must look for a bike with more seat notches farther away from the pedals. Even short users need a set of other good features to make working out a pleasure. These include adequate resistance levels, a comfortable seat, ease of use and installation, an easy to read console with at least a few basic workout metrics, and a smooth and quiet pedaling action. 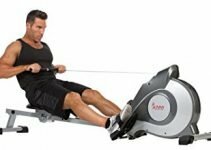 The following reviews for best recumbent bike for short people should help you pick one for your needs, but if you want to look at a wider range of them, Amazon is a good place to look online. The Exerpeutic 400XL features an adjustable magnetic tension control system with eight levels. You can find the level that’s perfect for you now and increase levels as your fitness improves. The tension control dial is below the LCD display, which attaches to the fly wheel and pedal assembly. 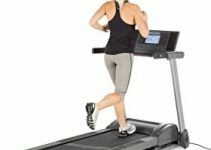 One user explains that the dial clicks into position at each tension level, so you can easily increase and decrease the tension settings for interval training without disrupting your workout. The v-belt double-drive transmission and precision balanced flywheel are designed to provide quiet operation. As users report, you’ll be able to listen to music or watch TV as you work out. One user found that the bike fits up to a standing desk, so you can work as you work out. Another user sets a laptop on tray table. All this is possible because this exercise bike is not a true recumbent. Instead of adjusting the seat by moving it forwards or backwards on a rail, you raise the seat like you would a hinged ladder. For smooth, consistent pedaling, the Exerpeutic 400XL supplies a three-piece “high-torque” cranking system. You can pedal both forward and backward. The pedals have straps for your feet, so you can pedal at higher rates without worrying that your feet will come off the pedals. The handle bars contain pulse sensors. You can track your heart rate on the large LCD display along with time, speed, distance, and calories burned. Users report that the heart rate reading is a bit high, but close enough to indicate your target range. The timer is accurate. Most users appreciate the back support and the comfort of the large seat, however, others say that it needs padding. The semi-recumbent design makes it easy to get on and off the bike. 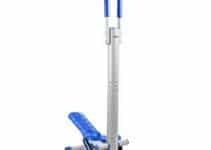 While the manufacturer states users should be between 5’2″ and 6’2″, those as short as 4’10 report using the bike easily and comfortably, albeit with a pillow behind the back to help their feet reach the pedals. The padded seat can be adjusted up and down in one inch increments. Most shorter users, but not all, have the seat at the lowest height. Users assemble the bike within 30 to 45 minutes and report that the instructions make assembly look much more complicated than it is. The bike measures 33″ L x 19″ W x 46″ H and folds to 20″ L x 17″ W x 54″ H, which one user compares to the floor space required by a kitchen chair. It weighs a very light 43 pounds and has wheels on the legs under the seat. One user reports that she moves it with just one hand. As the most popular recumbent bike for a short person on this list, here’s where you can buy the Exerpeutic 400XL. The Progear 555LXT allows you to choose one of three computer-controlled workout goal settings — distance pedaled, time pedaled, or calories burned. However, the calculation for calories burned can only be an estimate since you cannot store your personal data, such as your weight, in the computer. The bike also lacks a pulse detector and cannot display your heart rate. However, it is a cost effective option if you want a padded seat on a true recumbent design, solid construction, and very quiet operation. This bike comes with 14 levels of Magnetic Tension resistance for a wide range of fitness levels. The tension control dial is on the support for the monitor and within easy reach, so this bike could be used for interval training. You can pedal either forward or backward. The tension setting works in either direction. The wide screen LCD monitor displays large numbers, so you can easily track time, speed distance and calories. The monitor also tracks RPM (revolutions per minute), which tells you how fast you are pedaling. The monitor console includes a tablet or cell hone holder. Users suggest that it could also accommodate a magazine, a thin book, or an e-reader. However, users report that some of these items might block your view of the monitor. Users agree that the bike’s Quiet Drive belt drive is very quiet. You can listen to music or an audio book, watch TV, or watch a movie on your tablet as you exercise. A cup holder for a water bottle is located on the drive assembly to keep you hydrated. Because the seat slides from back to front on a rail, you can place it at exactly the right distance from the over-sized pedals. Many users around 5’0″ or 5’1″ report still having room on the rail to move the seat even farther forward to accommodate someone even shorter. The manufacturer designed the bike with a steel frame to support users who weigh up to 250 pounds. The step-through design makes it easy for anyone to get into the padded seat and use the bike. Users describe the bike as sturdy and durable. Reviews on the ease of assembly are mixed. Those who had difficulty assembling the bike had problems at different stages of assembly, however there wasn’t one step that consistently created a problem. It is suggested having a friend to help put it together. The bike measures 49″ L x 22″ W x 43″ H and weighs 60 pounds. It does not fold for storage, but it does have transport wheels on the front legs. Here’s where you can buy the PROGEAR 555LXT. The Sunny SF-RB921 Bike offers an eight-level magnetic resistance system with a double direction flywheel. You can pedal backwards or forwards. It has a handlebar by the monitor to help with getting on and off of the bike. The handlebars by the padded seat include a pulse monitor. Users aren’t certain of it’s accuracy, but it provides a general guide to your heart rate. In addition to your heart rate, the LED monitor displays time, distance, speed, and calories burned. The tension control dial is just above the flywheel assembly. If you wanted to use this bike for interval training, you might have to lean forward to increase and decrease the tension setting. The frame and padded seat are both adjustable, and one 4’11” user comfortably exercises on the bike. The step-through design makes it easy to get on and off the bike. The pedals are slip-resistant and include foot straps, so you can pedal fast. Some users reported that the front of the bike wobbled and the bike creaked when they reached higher speeds. Others did not have that problem. After a while the belt may start to slip, causing a clunking noise. Other users agree, however, that the bike operates quietly, and that for its really low price, it works well. Users report that the bike is easy to assemble, that the instructions and diagrams are clear, and that the parts are pre-sorted and well-marked. The bike does not fold for storage, but users comment on how compact it is. It measures 46″ L x 32″ W x 19.5″ H, weighs 56 pounds, and has transport wheels on the rear legs to make it easy to move around. Here’s where you can buy the Sunny Health & Fitness SF-RB921. Coming in at just under $300, the Universal R20 includes eight resistance levels and seven computer-controlled programs with lots of advanced features that are absent in lower priced models. Choose the Quick Start program if you don’t want use the menu selections. The Fun Rides selections include A Ride in the Park and Rolling Hills. The Mountains selections offer Pike’s Peak and Mt. Hood. Under challenges, you’ll find a cross training program for an interval workout and a ride with an uphill finish. Two users commented that the changes in tension between sections of the programs occurs smoothly. The bike’s steel frame is designed to support up to 275 pounds, and the step through design makes getting on or off of the bike easy. The padded seat adjusts in one-inch increments. Seat adjustment is easy but involves a few steps. One user said that her daughter, who is 4’9″, uses the bike comfortably. Users describe it as sturdy and easy to assemble. One user working alone took an hour to complete the project. A pulse sensor in the handlebars lets you track your heart rate. The monitor also displays speed, time, distance, calories burned, RPM, resistance level, and a bar graph of the increases and decreases in resistance levels in the program you are using. To save on batteries, you can purchase an AC adaptor for the monitor separately. The bike provides a cup holder for a water bottle and a small ledge on the monitor for a smart phone, e-reader, or paperback book. If you enjoy music while you exercise, the bike has built-in speakers. Users say it is quiet enough for TV or music. The bike measures 40.5″ L x 19″ W x 61″ H and weighs 78 pounds. It does not fold for storage, but it does have transport wheels on the front legs where the drive assembly is. To move the bike, users need only lift the end with the seat. Here’s where you can buy the Universal R20. The Schwinn MY16 230 comes with 20 levels of computer-controlled resistance and 22 preset programs. These include a quick start program, four beginner and four advanced heart rate programs, nine profile programs, one beginner and one advanced fitness test, and separate profiles for up to two users. The monitor displays calories burned, time, distance, a bar graph of the levels of resistance in the program you are using, and more. The dual LCD screens on the monitor lets you view the menus on one while watching workout stats on the other. The console also features buttons that allow you to easily adjust the bike’s speed and even incline. Use the media shelf and USB port to transfer your exercise data to the SchwinnConnect website or to a variety of fitness apps. You can also connect your MP3 player to the USB port and play your music through the acoustic-chambered speakers built in to the console. The pulse sensors are in the handlebars, but a few users complain that they aren’t sensitive enough for the heart rate programs on the bike to work. One user discovered that hand lotion improves the connection. If you want to use your own chest strap monitor, this bike is also telemetry-enabled. Users comment that the bike is very quiet and they also appreciate the three-speed fan, although one thought it was too small. Integrated levelers and a high inertia weighted flywheel ensures you get a solid and smooth workout. The plastic seat and seat back have small vent holes and there is lumbar support. Because the seat slides easily back and forth on a rail, two different users can easily adjust it to their height on their own. The step-through design and handlebars by the monitor make getting on and off of the bike easy, and in fact, also made our list of best recumbent bikes for seniors. While the seat is not padded, users found the comfort level to be acceptable. Users report that the assembly instructions were clear. Most took from 45 minutes to 60 minutes to finish assembling the bike. It measures 64″ L x 27″ W x 50″ H and weighs 93 pounds. It does not fold, but transport wheels are included on the front legs. Here’s where you can buy the Schwinn MY16 230.